Thankfully, we didn't lose our table even though none of us managed to arrive on time for our reservation. 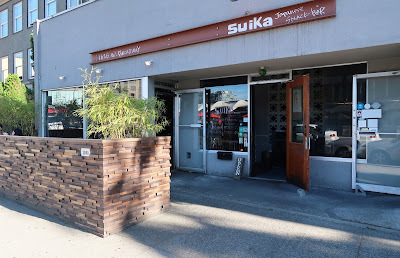 Suika is one of the most popular izakaya-style restaurants in Vancouver and is part of a group of restaurants that encompasses Kingyo, Suika, Rajio, and the newly opened Raisu. "Suika" is the Japanese word for watermelon, and there is an adorable watermelon ceiling lamp just above the main entrance. 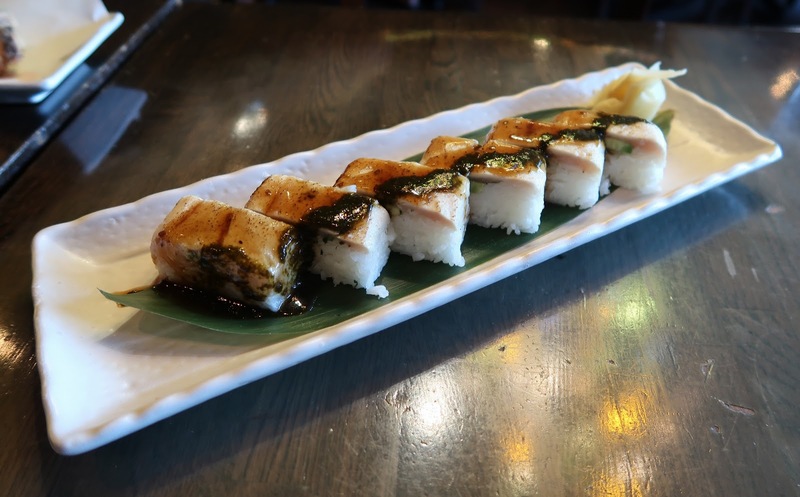 Inside, the atmosphere was exuberant, with the servers yelling the names of the dishes to the kitchen staff (a common practice in izakayas) and the full house of diners busily chatting away as they waited for their food. As a bonus, I even got a nice dose of the heebie jeebies from one of my biggest fears: the screaming baby of doom. A genius at the restaurant came up with the divine phrase, "No sushi no life." I can't agree more! Since all of us wanted to have a life, we ordered both types of sushi they had. The Aburi Shime-Saba Sushi consisted of seared, cured mackerel and mustard soy dressing on pressed sushi. The saba was very soft and juicy. 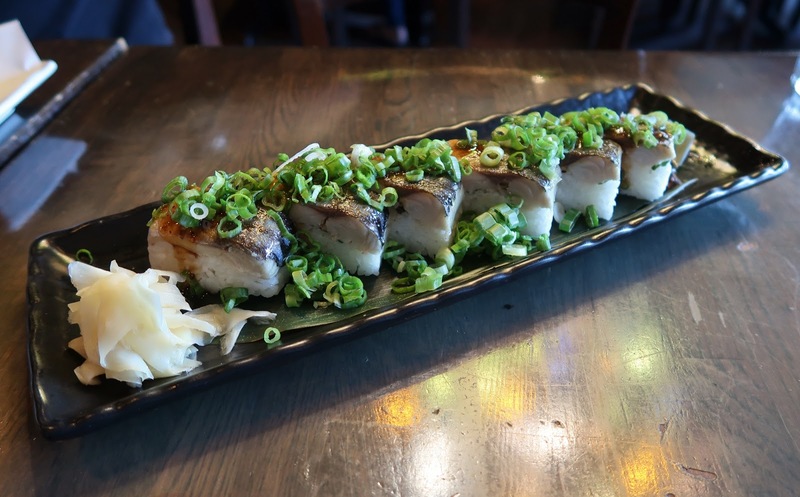 The soy dressing provided the saba with a rich flavour, and as Sean remarked, the sprinkles of green onion helped to balance out the characteristically fishy flavour of the saba. 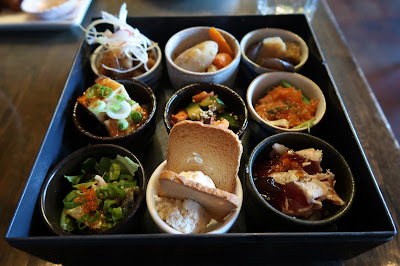 In order to have something nice to put on my Instagram feed, I ordered the Deluxe Suika Box, which came with 9 mini portions of various appetizers. In the top row, the Nan-Kotsu Nang Bang came with deep-fried chicken cartilage marinated in a Japanese sweet and sour broth. The broth had a lemony flavour and was a bit overwhelming, but to use the wording on the menu, the dish was also "such a refreshing!" The Lotus Root Kinpira was seasoned for an extra dimension of flavour, but could potentially fare better if presented with some broth, as some of the pieces ended up on the drier side. The Eggplant with Soy Bean Broth was well-executed, with cool, refreshing eggplant and a well-balanced broth. The Cold Tofu with Chili Oil came with tofu that I found to be neither flavourful nor smooth. The chili oil that accompanied it had a decent spicy flavour, but this was not really absorbed by the tofu. Next, the Cucumber and Tako in Kimchi was a hit as the tako (octopus) had an appealing chew and the spiciness of the kimchi was just right. The flavours worked together nicely in harmony. In the Negitoro Tartare, the very soft toro was evenly infused with a slight chili flavour for an extra kick. In the Salad with Saba, not much was done to balance the fishiness of the saba, as opposed to the Aburi Shime-Saba Sushi above. The Cracker with Shrimp Cream Cheese had a nice buttery flavour to it. Finally, the Tuna Tataki with Yuzu Jelly was another favourite of mine among the items in this box. The citrusy flavour of the yuzu jelly blended nicely with the soft, lightly seared tuna. 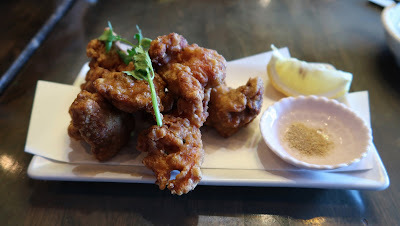 Moving on from the Deluxe Suika Box, the Chicken Karaage came with tender chicken and a crispy outer layer. The chicken exhibited a nice spicy zing in the background, but it could have been meatier and juicier. All three of us thought that this dish tasted "okay." Vancity Noms suggested this dish to me a while back, and I must say, this dish was "da bomb"! 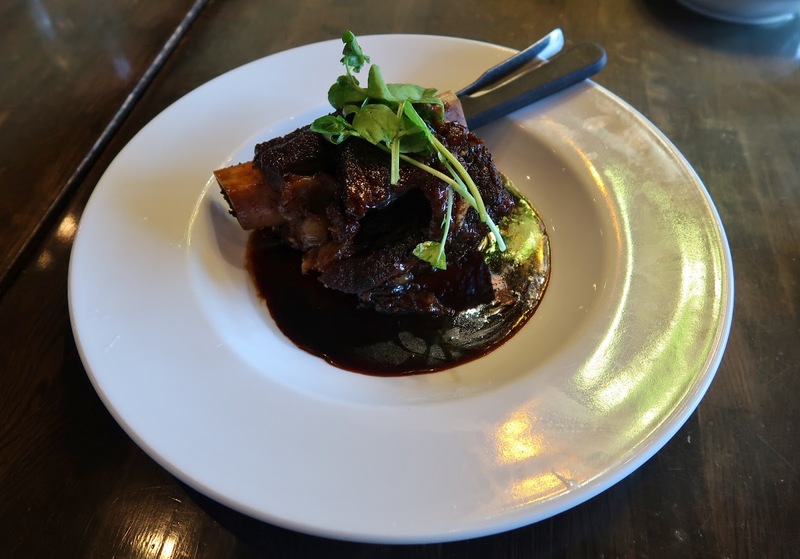 Featuring fried and tossed beef short rib with sweet balsamic and blanched spinach, this was a feast for both the eyes and the mouth. I loved the slight crispiness and subtle smoky flavour on the outside layer (which came from frying the short rib). Inside, the meat was very soft and almost melty. The rich flavour of the sweet balsamic was absorbed perfectly by the beef and releases a heavenly sweet and savoury explosion upon entering your mouth! The Beef Short Rib looks quite small in the photo above (and in many other food bloggers' photos as well), but in reality, I ended up having to share it with both of my grateful companions due to its size. This is definitely a must-try dish at Suika, but you might want to make it a sharable unless you are Vancity Noms... or Follow Me Foodie. Our server was very friendly and patient. He offered to repeat the names of the items in the Deluxe Suika Box multiple times for me just to make sure I had them down correctly in my notes, even though the restaurant was packed. While there were many average dishes, we were also served a handful of excellent dishes dispersed throughout the meal. The prices are not too far above average, and I was satisfied with the quality-to-price ratio. If you decide to visit Suika, be sure to make a reservation!